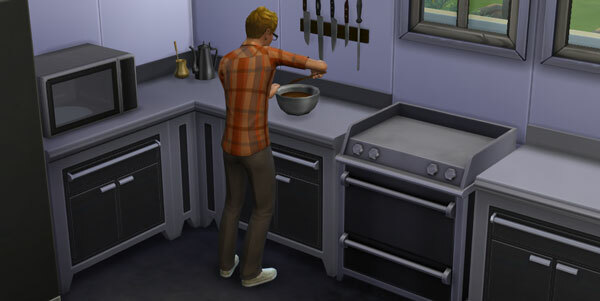 Declan was already interested in cooking as a teen, so he baked his own birthday cake. No one else was around to celebrate with him, so he continued with the task of growing up on his own. Declan wasn’t the only one growing up. Callie too found the years catching up with her at last. Her twin sister followed shortly thereafter. Both were quite happy with what they had achieved so far in their lifetimes. Nevertheless, Clara continued to work around the house and hone her skills. Declan, in his newfound adulthood, immediately started looking for someone to help him continue the Jones family legacy. On one of her walks around the neighbourhood, Callie discovered a huge tree, much bigger than any other she had seen. Something told her to care for the tree. After several visits where Callie talked to and cared for the great tree, she noticed something she hadn’t seen before. There was an opening in the great tree’s trunk. An opening large enough for a Sim to squeeze into. There seemed to be a sound coming from inside the tree. Was the tree at last talking back to her? Further inside, Callie came across a stream, and she decided to follow it, and eventually she entered a strange mist. Through the mist, Callie at last spotted an exit, and found herself in Sylvan Glades, a beautiful and apparently untouched spot. Callie spent the rest of the day in the special place she had discovered, and wondered if she would share the secret with her family. Was she truly the first Jones to discover this magical place? She thought perhaps she was. Darlene found high school quite challenging. She often felt close to burning out. Clara always looked stylish when she went to work. Declan spent much of his youth wondering just what it was his aunt did for a living. For an up-and-coming secret agent, Clara didn’t seem to have the best social skills. In fact, other Sims in the neighbourhood found her rather dull. Perhaps because she couldn’t talk about all her exciting secret missions? Callie fared somewhat better than Clara in the social department, even though her job required her to be unpleasant to people on a regular basis! After the traumatic destruction of the family dollhouse, Callie decided to add some new toys to Darlene’s playroom. Over the years, the family had amassed a large collection of dolls. They made the playroom feel extra playful. Meanwhile, Clara was working on becoming the best secret agent she could be. Keeping fit was just one aspect of that. Darlene still looked up to her brother, but she couldn’t help wonder if he had been the one to trash her beloved dollhouse. She wasn’t brave enough to ask him about it, though, so she would probably never know. The dollhouse eventually slipped her mind as her birthday arrived. Darlene grew up into a geeky teenager with romantic aspirations. Declan and Darlene continued to spend time together. As Declan grew older, however, Darlene had to find ways to entertain herself. The old family dollhouse (which had originally belonged to Bianca) was one of her favourite toys. Declan grew up into an outdoor-loving teenager. Growing up without a father was difficult for Declan. Although his aunt Clara was always there to comfort him, it wasn’t the same. One day Darlene returned home from school to find that her dollhouse had been destroyed. Who could have done something so horrible? Despite her job and her children keeping her busy, Callie still found time to make new friends around the neighbourhood. Clara preferred to stay at home and look after the house. She got all the excitement she needed at work. Darlene adored her older brother and followed him everywhere. Declan humoured her as he grew older, knowing they had to stick together, even when it was inconvenient for him. When Callie was at home, she tried her best to care for her family. Unfortunately, she had many skills, but cooking was not one of them. Bianca had just finished up a nice relaxing bath when she realised it would be her last. Grim had hardly left the Jones residence when he felt compelled to return, to take Bianca Jones, the last surviving member of the second generation of Joneses. Sadly no one was home to witness her passing. Bianca, Bryant Jones’ adopted sister, had been an outgoing perfectionist, and a bit of a slob, with a love for music. Her skill with the violin was unparalleled. Meanwhile, little Darlene had grown up. She loved food, and dreamed of being an astronaut one day. Declan was delighted to have someone to play with at last. Callie found single parenthood a bit challenging, often working herself to exhaustion.